yang lebih besar dengan citra aslinya dibandingkan citra JPG maupun citra PNG. Nilai GCE dan MSE yang dihasilkan dari ketiga ekstensi tersebut juga relatif kecil, mendekati 0. Ini menandakan citra hasil segmentasi memiliki nilai kesamaan yang yang besar dengan citra aslinya. Selanjutnya citra BMP juga memiliki nilai PSNR yang paling besar dibandingkan dengan citra JPG dan citra PNG. D. Putra, Pengolahan Citra Digital, Yogyakarta: Penerbit ANDI, 2009. Nurhasanah, "Segementasi Jaringan Otak Putih, Jaringan Otak Abu-Abu, Dan Cairan Otak Dari Citra MRI Menggunakan Teknik K-Means Clustering," Jurnal Aplikasi Fiska, vol. 7, no. 2, pp. 90-95, 2011. T. Sutoyo, E. Mulyanto, V. Suhartono, O. D. Nurhayati, Wijanarto, Teori Pengolahan Citra Digital, Yogyakarta: Penerbit ANDI, 2009. B. R. Jipkate, V. V. Gohokar, "A Comparative Analysis of Fuzzy C-Means Clustering and K Means Clustering Algorithms," International Journal Of Computational Engineering Research, vol. 2, pp. 737-739, 2012. A. S. B. Samma, R. A. Salam, "Adaptation of K-Means Algorithm for Image Segmentation," 2009. Preeti Panwar, Girdhar Gopal, Rakesh Kumar, "Image Segmentation using K-means clustering and Thresholding," International Research Journal of Engineering and Technology (IRJET), vol. 03, no. 05, pp. 1787-1793, 2016. Gonzalez,Woods, Digital Image Processing, 2nd Edition, Prentice Hall, 2002. B.Sathya, R.Manavalan, "Image Segmentation by Clustering Methods: Performance Analysis," International Journal of Computer Applications & Information Technology, vol. 29, pp. 27-32, 2011. R. Sardana, "Comparitive Analysis of Image Segmentation Techniques," International Journal of Advanced Research in Computer Engineering & Technology, vol. 2, pp. 2615-1619, 2013. M. Sharma, V. Chouhan, "Objective Evaluation Parameters of Image Segmentation Algorithms," International Journal of Engineering and Advanced Technology, vol. 2, pp. 84-87, 2012. I Wayan A. W. K., Afriliana K., "Penerapan Algoritma K-Means pada Kompresi Adaptif Citra Medis MRI," INFORMATIKA, vol. 11, no. 2, pp. 139-151, 2015. Dika Asoka Masatu, Indah Soesanti, Hanung Adi Nugroho, "PENERAPAN ALGORITMA KOMPRESI JPEG DAN METODE FUZZY C-MEANS PADA KOMPRESI CITRA BERBASIS ENTROPI," Jurnal Penelitian Teknik Elektro dan Teknologi Informasi, vol. 1, no. 1, pp. 7-11, 2014. Dika Asoka Masatu, Indah Soesanti, Hanung Adi Nugroho, "Penerapan Algoritma Kompresi JPEG dan Metode Fuzzy C Means pada Kompresi Citra Berbasis Entropi," Jurnal Penelitian Teknik Elektro dan Teknologi Informasi, vol. 1, no. 1, pp. 7-11, 2014. S. M. Aqil Burney, Humera Tariq, "K-Means Cluster Analysis for Image Segmentation," International Journal of Computer Applications, vol. 96, no. 4, pp. 1-8, 2014. Poonam fauzdar, Sujata Kindri, "Comparitive Analysis Of K Means And Fuzzy C Means Algorithm," International Journal of Engineering Research & Technology (IJERT), vol. 2, no. 6, pp. 2088-2095, 2013. S. panda, "Color Image Segmentation Using K-means Clustering and Thresholding Technique," IJESC, pp. 1132-1136, 2015. Anju Bala, Aman Kumar Sharma, "Color Image Segmentation using K-Means Clustering and Morphological Edge Detection Algorithm," International Journal of Latest Trends in Engineering and Technology (IJLTET), pp. 48-55, 2016. S. J. Saida, L. Srinivas, R. Sivaram, "An Efficient K-Means and C-Means Clustering Algorithm for Image Segmentation," International Journal of Science and Applied Information Technology, vol. 1, no. 5, pp. 84-87, 2012. R. S. Kabade, M. S. Gaikwad, "Segmentation of Brain Tumour and Its Area Calculation in Brain MR Images using K-Mean Clustering and Fuzzy C-Mean Algorithm," International Journal of Computer Science & Engineering Technology, vol. 4, pp. 524-531, 2013. Jiawei Han, Micheline Kamber, Jian Pei, Data Mining Concept and Techniques Third Edition, Morgan Kaufmann, 2012. Jiawei Han, Micheline Kamber, Data Mining: Concepts and Techniques Second Edition, Diane Cerra Publisher, 2006. M. North, Data Mining for the Masses, 2012. 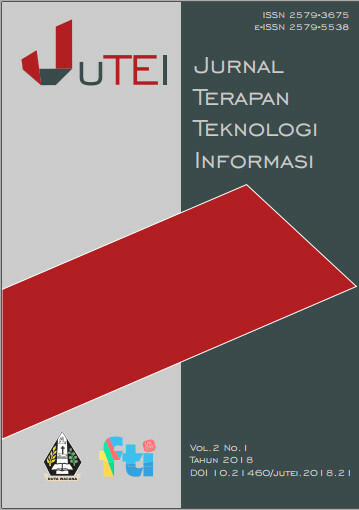 I. Soesanti, A. Susanto, T. S. Widodo, M. Tjokronegoro, "Analisis Komputasi pada Segmentasi Citra Medis Adaptif Berbasis Logika Fuzzy Teroptimasi," Forum Teknik, vol. 33, no. 2, pp. 89-96, 2010. Irwanto, Yudhi Purwananto, Rully Soelaiman, "Optimasi Kinerja Algoritma Klasterisasi K-Means untuk Kuantisasi Warna Citra," JURNAL TEKNIK POMITS, vol. 1, no. 1, pp. 1-6, 2012. S. Jani, "An Efficient K-Means and Fuzzy C-Means Clustering Algorithm for Image," International Journal of Engineering Research & Technology (IJERT), vol. 1, no. 5, 2012. A. W. Kusuma and R. L. Ellyana, “PENERAPAN CITRA TERKOMPRESI PADA SEGMENTASI CITRA MENGGUNAKAN ALGORITMA K-MEANS”, JUTEI, vol. 2, no. 1, pp. 65-74, Jul. 2018.